Longtime readers of this column will probably know the drill by now: Each month Courtney and I pick a topic, we both write about it, I’m infinitely more correct in my assertions than she is, and we all learn a little something in the end. Mostly from me. This month, however, Courtney and I have failed to come to an accord on that most essential item in this column: the topic. 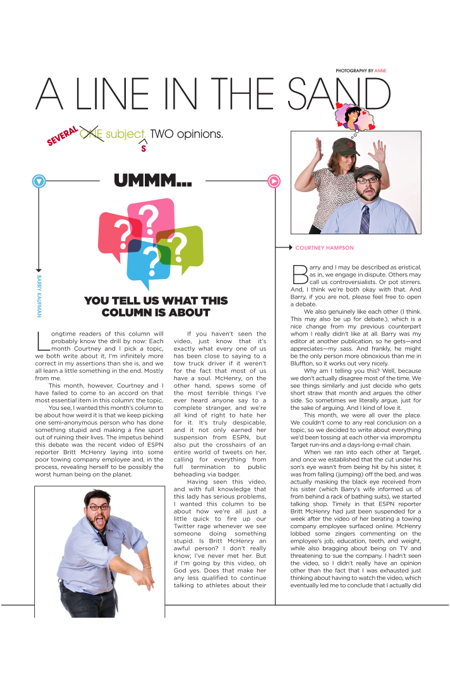 You see, I wanted this month’s column to be about how weird it is that we keep picking one semi-anonymous person who has done something stupid and making a fine sport out of ruining their lives. The impetus behind this debate was the recent video of ESPN reporter Britt McHenry laying into some poor towing company employee and, in the process, revealing herself to be possibly the worst human being on the planet. If you haven’t seen the video, just know that it’s exactly what every one of us has been close to saying to a tow truck driver if it weren’t for the fact that most of us have a soul. McHenry, on the other hand, spews some of the most terrible things I’ve ever heard anyone say to a complete stranger, and we’re all kind of right to hate her for it. It’s truly despicable, and it not only earned her suspension from ESPN, but also put the crosshairs of an entire world of tweets on her, calling for everything from full termination to public beheading via badger. It’s such a non sequitur, it sort of shorts out your brain if you ask it like that. Why should she be fired for being super mean to some lady? Reprimand her, maybe think less of her as a person, but don’t ruin her life over it. She’s a highly qualified professional in the field of talking to sports people about the sports ball things they do in the sport field, which has diddly squat to do with her conduct towards tow truck drivers (unless those tow truck drivers have just won the Indy 500). Granted, this tweet is offensive on pretty much every level that exists, and a few they had to invent just to quantify what a horrific tweet this was. Sacco hit send, despite presumably having a brain in her head, and boarded a plane. By the time she took off, the tweet had gone viral. What had been a tasteless remark aimed at a handful of followers was spread all over the Web. By the time she landed, the virtual mob had identified her, found out everything there was to know about her, notified her employers of the awful tweet (which drew an official response from her company) and even sent someone to meet her at the airport. In the span of one flight, Justine Sacco’s life had been completely torn apart. Because of one tweet. An undeniably ignorant, disgusting tweet, but just 140 characters. We’ve all said something we regret. We’ve all done something we wish we hadn’t. I’m not trying to defend what she wrote, but I find it equally hard to defend how it cost her everything in the span of a few hours. So with Britt McHenry the latest in the “slow news day” firing line, I was really hoping that we could argue about it. Courtney would come back with her stance that since this McHenry woman is a public figure, her private conduct reflects on her ability to engage the public that she’s obviously very willing to spit on when they get in her way. I was hoping that Courtney would present a few salient points to counteract my own, and hearty discourse would occur. But then Courtney decided that a three-minute video wasn’t worth her time, so she didn’t watch it. Her response was to try and pick a fight over which was our favorite Disney movie. My reply of course, was The Lion King, a film so perfect in every way that its place at the head of the Disney pantheon isn’t even up for debate. Barry and I may be described as eristical, as in, we engage in dispute. Others may call us controversialists. Or pot stirrers. And, I think we’re both okay with that. And Barry, if you are not, please feel free to open a debate. We also genuinely like each other (I think. This may also be up for debate. ), which is a nice change from my previous counterpart whom I really didn’t like at all. Barry was my editor at another publication, so he gets—and appreciates—my sass. And frankly, he might be the only person more obnoxious than me in Bluffton, so it works out very nicely. Why am I telling you this? Well, because we don’t actually disagree most of the time. We see things similarly and just decide who gets short straw that month and argues the other side. So sometimes we literally argue, just for the sake of arguing. And I kind of love it. This month, we were all over the place. We couldn’t come to any real conclusion on a topic, so we decided to write about everything we’d been tossing at each other via impromptu Target run-ins and a days-long e-mail chain. When we ran into each other at Target, and once we established that the cut under his son’s eye wasn’t from being hit by his sister, it was from falling (jumping) off the bed, and was actually masking the black eye received from his sister (which Barry’s wife informed us of from behind a rack of bathing suits), we started talking shop. Timely in that ESPN reporter Britt McHenry had just been suspended for a week after the video of her berating a towing company employee surfaced online. McHenry lobbed some zingers commenting on the employee’s job, education, teeth, and weight, while also bragging about being on TV and threatening to sue the company. I hadn’t seen the video, so I didn’t really have an opinion other than the fact that I was exhausted just thinking about having to watch the video, which eventually led me to conclude that I actually did have an opinion. I didn’t care. Sometimes not caring is an opinion, in my opinion. Mrs. Mateyka, mother to Lisa, one of my oldest friends (and college roommate) told me 24 years ago (while I was yelling at the women in the housing office at West Virginia University because we requested bunk beds and didn’t get them) that I would get more bees with honey. I’m still learning that lesson. I’m not going to lie. I have certainly muttered under my breath a time or two, when not receiving the customer service I desire, “This would make a good column for next month.” It doesn’t make it better. Should McHenry have been suspended for losing her temper? I don’t think so. Is insulting someone, outside of your work place, a suspendable offense? I don’t think so. Perhaps the Twitter shaming alone was punishment enough. How did we go from loud-mouthed ESPN reporters to the topic of royal baby news? I don’t know. We dabbled briefly on what the new member of the monarch would be named and came to the conclusion that Elsa would be best. And then, we just let it go. Which led us to the next topic. Best Disney movie ever. Barry fired back, in record time, “Lion King, obvs.” First Barry, please never use the term “obvs” again, because you are no longer a 13-year-old girl. And second, everyone knows that Aladdin is the best Disney movie ever. At this point, it was only natural that we fight about fighting. Specifically the May second Floyd Mayweather, Jr. vs. Manny Pacquiao fight. Barry was most baffled by the number of people who watched the fight (neither of us did). Seems his Facebook feed (which I thought he was quitting based on last month’s column?) was all aflutter with fighting fans, and he was weirded out. Whereas, I was weirded out by the fact that the loser of the fight received $120 million. That seems a tad high for a loser. So why do Barry and I argue just for argument’s sake (other than obvious fanfare and VIP treatment that this column garners us everywhere we go)? Well, it seems we’re not the only ones. We’re just following the trend. Deborah Tannen, a linguistics professor, and one whom I quote often in my public communication course at USCB, studies patterns of communicating. In her book, The Argument Culture, she focuses on public discourse—in the press, politics, the law, and education—and speaks to the overwhelmingly adversarial society that we have become. She looks at the metaphors that pervade our talk: the war on drugs, the Mommy wars, the battle of the sexes, politicians’ turf battles. And she questions why we think everything we need to accomplish must be structured as a fight between two opposing sides. Line in the Sand: Our Top News Stories Tonight at 8PM! Line in the Sand: Facebook... Should I stay or Should I go?